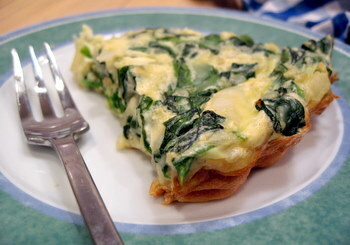 One of my favorite breakfast meals is crustless quiche. Prepare a large pan on Sunday afternoon and you’ll have breakfast covered for the next week. Trust me; you will not miss the crust! The following recipe is one of my favorite concoctions (spinach and mushroom quiche) The best part is that you can have fun with it; keep the basics (eggs, milk, salt and pepper) and then throw in left-over’s from last night’s dinner to create your own quiche—be creative and have fun!